Darrell Langham’s incredible catch and Michael Badgley’s game-winning field goal were not the only memorable moments during the Miami Hurricanes’ win over Georgia Tech this past Saturday. At halftime, many UM football legends, including Michael Irvin, Warren Sapp, Ray Lewis, Ed Reed and the late Sean Taylor were inducted into the Miami Hurricanes Ring of Honor. The class of 2017 was honored at a luncheon on Friday, Oct. 13, at the Turnberry Isle Resort. 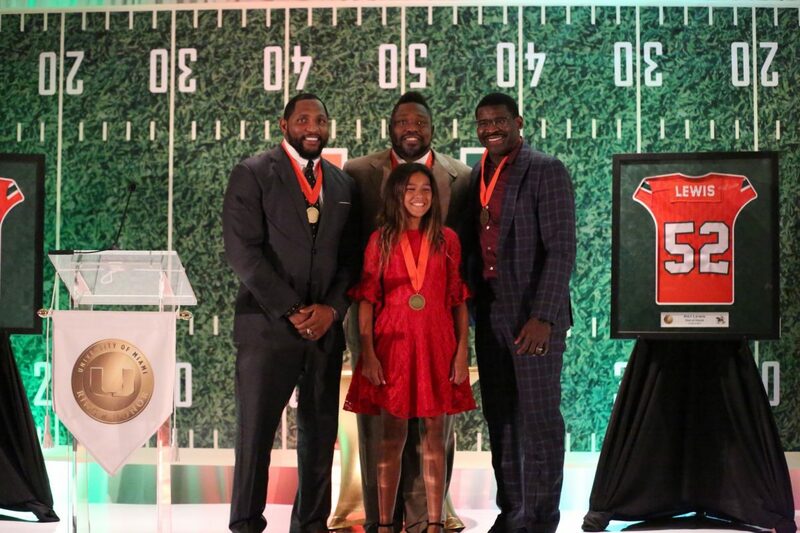 At the event, Lewis, Sapp and Irvin all gave emotional speeches reflecting on their times at the U.
Irvin was a freshman All-American in 1985 and a second team All-American in 1987. During his three years as a Hurricane, Irvin set many records – including the most receiving touchdowns in UM history with 26, the third-most receiving yards with 2,423 and tying for the fourth-most receptions with 143. Irvin led the Canes to a national championship in 1987. In 1988, Irvin was drafted by the Dallas Cowboys and won three Super Bowls with the team. Irvin was inducted into the UM Sports Hall of Fame in 2000 and into the Pro Football Hall of Fame in 2007. Irvin has a son who currently plays for Miami, sophomore tight end Michael Irvin Jr.
Sapp had one of the greatest seasons ever for a UM defensive player in 1994, winning Big East Defensive Player of the Year. He was also named Defensive Player of the Year by the Football Writers’ Association of America, Sports illustrated and ABC Sports. Miami’s defense was the No. 1-ranked total defense and scoring defense that season. During his NFL career with the Tampa Bay Buccaneers, he was selected to seven Pro Bowls and won the Super Bowl in 2002. Sapp was inducted into the UM Sports Hall of Fame in 2005 and the Pro Football Hall of Fame in 2013. Lewis was one of the most intimidating linebackers ever to come to the school. Lewis was made the All-Big East team in 1994 and 1995. During his time at the U, he had 312 total tackles, which ranks sixth in Miami’s record books. Lewis was drafted in 1995 to the Baltimore Ravens and went on to become a two-time Super Bowl Champion and 13-time Pro Bowler. In his 17 NFL seasons, Lewis had over 2,000 career tackles. He was inducted into the UM Sports Hall of Fame in 2006. Reed developed into one of the best safeties in the country at Miami. During his last two seasons at the U, he was a first-team All-American and made the All-Big East team. In 2001, he led the Hurricanes to a national championship. Reed holds the record for most interceptions at Miami with 21. He also has the most interception return yards with 398. With Lewis as a teammate, he led the Baltimore Ravens to a Super Bowl Championship in 2012. Reed was selected to nine Pro Bowls throughout his career and won Defensive Player of the Year in 2004. Reed was inducted into the UM Sports Hall of Fame in 2012. Taylor was represented by his daughter Jackie at the ceremony. Taylor took over Reed’s position in 2003 and thrived in the role. That season, he led the nation in interceptions, and currently holds the UM record for most pick-sixes in a season with three. He was an All-American in 2003 and was named Big East Player of the Year. He ranks fifth all-time in interceptions at Miami with 14 and is second to only Reed in interception return yards with 306 yards. He was selected to two Pro Bowls with the Washington Redskins. Taylor was a part of the Miami team that won the 2001 National Championship, and he was inducted into the UM Sports Hall of Fame in 2015. Taylor passed away in 2007 after being shot in the upper leg by a burglar who broke into his home. These five players added to UM’s outstanding list of players in the Ring of Honor. There are now 23 players that have been inducted.